"I've always had a thing for Nintendo's portables"
The 3DS eShop — along with its online store predecessors on Wii and DSi — has attracted a number of small developers that would have likely remained anonymous in previous generations. The evolution of download gaming has transformed our consoles to include smaller, more diverse experiences at lower costs. It's well known that Nintendo made errors with its Wii and DSi stores that led to controversy, whether the issues were related to technical limitations or punishing publication terms. In any case, and in the face of additional increasing and varied competition from the smartphone and tablet industry, Nintendo has been delivering a turnaround with the 3DS eShop and — if reasonably positive early days are an indication — on the Wii U eShop. Improvement is still possible and needed, of course, but the 3DS platform in particular is showing signs of developing strength. While I was working on the two Bionic Commando games at Grin, I realised I vastly preferred working on smaller projects rather than big budget retail games. A recent indicator of that was the revelation from Gunman Clive developer, Bertil Hörberg, that his game has sold more copies in around one month on the 3DS eShop than in over eight months on the Apple iOS platform — Google Android has been the biggest selling market for the title since its release in April 2012. Precise figures weren't given, but it was nevertheless encouraging the the handheld's platform was serving a small developer so well. Since those revelations we've spoken to Hörberg, in order to learn more about the background of his development studio and his move onto the 3DS store. Hörberg, like many small developers, isn't an inexperienced entrepreneur making his industry début with his own game, but rather a programmer that's previously experienced life at the coal-face of larger endeavours. He worked for "various studios" for a few years, working on titles such as Bionic Commando Rearmed as well as the recently released Pid, though he left that project after a year. His previous experience can be summed up by a continual desire to pursue his own path. "While I was working on the two Bionic Commando games (Rearmed and the 3rd person retail game) at Grin, I realised I vastly preferred working on smaller projects rather than big budget retail games", he explained. "I also didn't really enjoy working at a big studio, so I've been pretty much moved to smaller and smaller companies until I finally went solo in 2011." 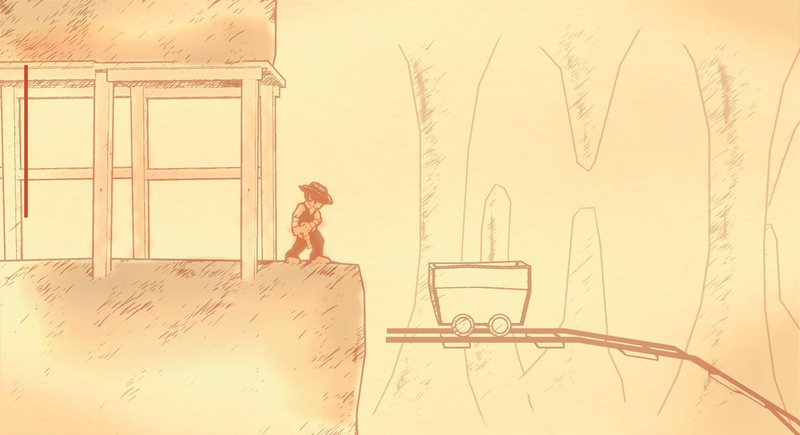 In fact, development studios don't get much smaller than the self-named Gunman Clive publisher, with Hörberg confirming that Arne Hörberg is perhaps a surprise appearance in the credits, with the music composition being an undertaking in the latter's spare time. Amazingly, considering the praise for the soundtrack — it's even on sale for $1 if you like it enough — Arne Hörberg doesn't normally work with games or music. "I was somewhat sceptical at first but the results turned out much better than I expected, so that saved me the trouble of finding a composer." Aside from that, Bertil Hörberg tells us, he does everything himself. Though hindsight has proven to be a wonderful thing in terms of the title selling well on the platform and bringing welcome profits to the one man studio, we asked what brought Hörberg from smartphone development to the 3DS eShop. I've always felt much more at home with dedicated gaming platforms, so after having released a few games on smartphones and started seeing some small profits, I thought I might be ready to branch out. 3DS eShop seemed like the easiest market to get into and the best suited for my type of games. Plus I've always had a thing for Nintendo's portables as I did some of my first gaming on the original Game Boy (and some of my first coding in the Game Boy homebrew scene). When asked directly about the place in the market for devices such as the 3DS, the developer unsurprisingly voiced his support while acknowledging the emergence smartphone market. "I believe they are still, and hope they will remain, very important. I've always enjoyed handheld gaming, but smartphone gaming is for the most part something completely different." While naturally not willing to make sweeping generalisations, Hörberg reiterated that he's a case where it seems as if the 3DS release will bring him greater financial success than the smartphone market; no doubt there will be developers, however, with the reverse experience. I've always enjoyed handheld gaming, but smartphone gaming is for the most part something completely different. In terms of becoming an approved developer for 3DS, it seems that the process wasn't too difficult; "I basically just applied to become a licensed developer via Warioworld, ordered a debug unit and started coding" — previous connections with Nintendo of Europe may have also helped. As an insight into the steadier, licensed approach from Nintendo, Hörberg explained the slower process of publishing to eShop, moving away from the more automated processes for Google Play and iOS. "There's no denying that it's a lot longer process to get it published on the eShop, but it's not too bad", he clarifed. "Other than the obvious things like needing age ratings and much more thorough testing, it's a bit less automated and involves more emailing back and forth to different departments to get everything submitted and ready for release." Shifting the game itself to Nintendo's hardware was an altogether simpler process, however, and we were given an insight into the speed with which initial porting of the title took place. It wasn't very hard at all; I had everything up and running after about two weeks. I hardly use any middleware in my engine so I could just move over all my code at once and just change the rendering and other hardware specific functionality. Then it took a bit of extra optimising to get it to run at 60fps in 3D. You get to code a bit closer to the hardware than on smartphones, and also have to be a bit more careful with memory management. Doing the stereoscopic rendering is pretty straight forward, you just render everything twice, but you have to find the most efficient way to set up the rendering order. The attractive paper-filter effect apparently "took some tinkering", while initial hesitation about employing the stereoscopic 3D was eased by the reaction from gamers. "The art style is kind of trying to fake a 2D look, so adding actual stereoscopic 3D to that felt a bit weird to me, so I was a bit surprised by the incredibly positive reactions to the 3D feature". In a positive for the hardware itself, meanwhile, Hörberg has been pleased with some of the tools at his disposal. I'm pretty impressed by the GPU. It's performing much better than most of the smartphones and tablets I've tried the game on. Obviously the screen resolution is much lower, but I'm rendering with 2X2 FSAA on the 3DS version, which puts it in the range of smartphone resolutions, and it's still keeping up. It also has some pretty nice features despite using fixed funtion pixel shaders, and I didn't even touch on the lighting capabilities in Gunman Clive. Perhaps the simplest and most vital gameplay addition that 3DS offered was physical controls, with most smartphones and tablets only accommodating virtual buttons. The original design and prototypes of Gunman Clive were for systems with physical controls, which only specific phones such as iCade and Xperia PLAY could deliver in the original release. The basic controls of 3DS allow it to be played "as it's meant to be played", with the developer also telling us that Mega Man was the primary influence on the core gameplay, with other elements inspired by games ranging from "Castlevania to Mario and Zelda 2". 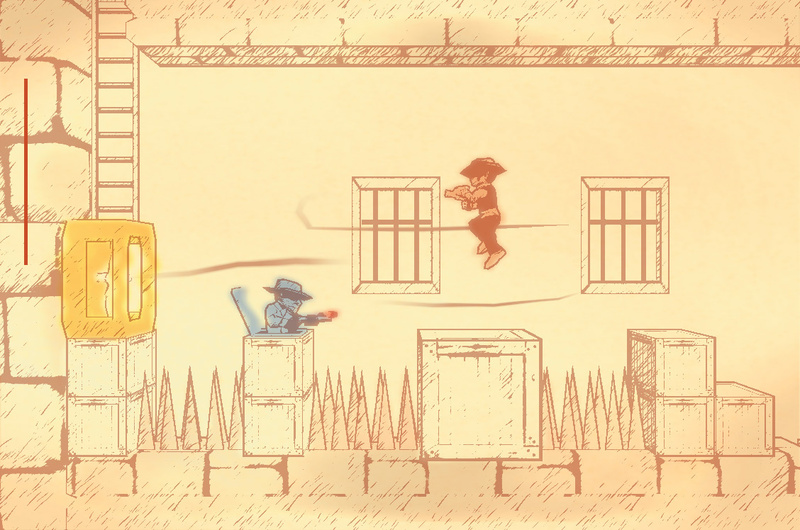 It seems that Gunman Clive and the 3DS eShop are an ideal match. Hörberg, as the latest new developer to dive into the 3DS eShop, is actually a longer term supporter of Nintendo's download stores, giving his take on the platforms and the currently library on the latest handheld's marketplace. I've actually always liked Nintendo's online stores; they're not quite as quick to navigate as some others, but there's a certain charm to it with the nice music and download animations; they feel more like a game menu than a boring online web store. Having trailers for every game also gives the 3DS eShop a pretty big advantage against some of the others, and it seems to do a good job in promoting various titles with the different categories added to the front page every week. The library still isn't that big but it's getting there; there's a few gems on there, and as a Picross junkie I can't complain. Perhaps most encouragingly in Nintendo's continuing efforts to establish a loyal group of small "indie" developers on its platforms, Hörberg is "definitely" returning to the 3DS, telling us that his next game "will focus on the 3DS from the start", with some potential ports to follow. Although Wii U development would be "fun", Nintendo's handheld is apparently "quite enough to handle at the moment" for this one man studio. We'd like to thank Bertil Hörberg for his time. Gunman Clive is currently available in the Nintendo eShop in Europe and North America for £1.99/€1.99/$1.99, and you can read our full review for more details. Let us know what you think about this title and Bertil Hörberg's comments in the comments section below. It's a great appetizer of a game he made. He has to be proud. He's a done a very fun game. I'm very happy to hear that his next game will be for rhe 3ds, if he can keep the same quality, my money is his. Also, great read! I'm glad I downloaded this game. I'm enjoying finding out the behind-the-scenes aspects to getting a game released on the eShop. There have been a lot of Gunman Clive stories in the nintendolife news lately, but I've enjoyed them all. Really cool to hear the experiences of the small developers. I hope Horberg's success continues. Developed a whole game by himself? Now that's skill! I've always had a thing for Nintendo's portables as well. Then last night we got drunk and she made a total @$$ of herself in public. She's not so cute to me any more... lol jk I do and always will love Nintendo portables! I'll be paying video games until the end of my days. They make me happy happy, joy joy. "Europe and North America for £1.79/€1.99/$1.99"
It's £1.99 in the UK. @C-Olimar So it is, thanks. I've updated the game page and the article. Wow. That's really encouraging to hear that he was able to port his game over in a just a couple weeks! Haha, man, Nintendo certainly doesn't add any frills to its websites if they don't have to worry about the consumer seeing it! I love how the publisher application picture shows a GCN controller and memory cards. Great read! Getting to know the stories behind creations always adds to the final product. I really enjoyed this game with all it's references., just finished Hard Mode with Ms. Johnson and starting Duck Mode this week. I am now considering getting this. 1.99 is not a bad price. I would not have known of this AWESOME game had it not been for NL. I love the music, art style and game play!! Its SO EASY AND PLEASING TO MY EYES! ^__^ The 3D really pops out in this game!! I still think Gunman Clive should be @ least $2.99 cuz it's a steal for $1.99. Really! I purchased Gunman Clive along with Hydroventure: Spin Cycle last night and I gotta say that I'm impressed with it. The platforming is fun, the art style and 3D are beautiful and the music is great as well. Very glad I dropped the $2.50 for it! Okay Horberg, now we just need a fix for the train boss crash issue in NA! I love this game BTW! Very encouraging as to how easy it was to port his game to the eShop. Hopefully we'll see a lot of quality titles from indies in the future. Sometimes it takes that extra person to say things like "hey, we should add some contrast to this game, I hear black lines look good when they are black", lol okay, mean but the colors really bug me. But where did he get Duck Mode from? The most bizarre, awesome new game + ever. I look forward to his next release. Boy, I still need to download this. I think I'll do that today or tomorrow. This was a fun read. It's always so cool to see interviews like these. How did it take 7 years to make retro city rampage when this game looks way better and was made in 2 years max? And both of them being made by one person. I currently have 4 games on my 3DS SD card: Gunman Clive, Super Mario 3D Land, escapeVektor, and Pushmo. So far, Gunman Clive is my most-played game. It's just so fun to play (and I still need to play through with the female character)! Btw, just curious but what's Mr. Horberg's nationality? Sounds German to me. Well, there we have it; straight from the horse's mouth (no offence, Bertil ). I'm looking forward to seeing what his next project will be. This article gets too many people excited about development, reality is it's very expensive and rigorous. $100 a year for IOS, upwards of $5000 for eshop and no guarantee your app will ever be published. Additionally, you must have a non subleased office, website, trademarks, business telephone and email. None of which is required on other platforms. This isn't indie. @Dogpigfish I know I wouldn't want to be excited for future developments. Please don't even consider bringing out anything in the future Circle-Bertil Hörberg-or any other developers we sure don't need anything new or sequels. BTW Nintendo just dropped its requirements for an office for future developers. This guy is a great developer, don't get me wrong. The big 3 sees the problem with independent talent, so they misconstrue what indie really is, because it's a threat to their bottom line. Don't let them redefine what indie is. Indie stands for independent developers, not independent studios. He comes from the same country as me... Sweden. @KonsumKasse - Ah okay that's cool. Thanks! @Metabble_King yeah I believe it's a rumor at this point or in it's beginning phase. I don't really concern myself with that end of the business I just want a fun experience. I probably shouldn't have even involved myself with this part of the thread in my ignorance of these facts. Best two dollars I spent in a long time. I am glad that he is having a huge success on the 3DS. I would definitely be interested in any other games he may bring to the eShop.